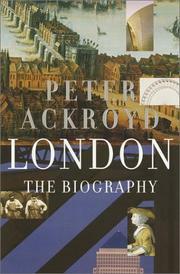 An impressionistic history of England’s capital city, by British novelist/biographer Ackroyd (The Plato Papers, 2000, etc. ), who knows his subject well and writes about it with considerable passion. Somewhat rarefied, but a splendid tribute to the great metropolis.